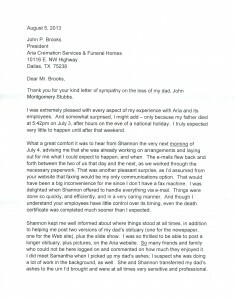 Thank you for your kind letter of sympathy on the loss of my dad, John Montgomery Stubbs. 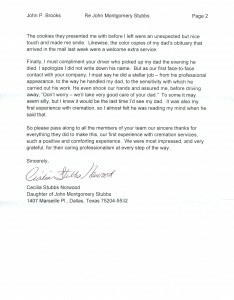 I was extremely pleased with every aspect of my experience with Aria and its employees. And somewhat surprised, I might add-only because my father died at 5:42 pm on July 3, after hours on the eve of a national holiday. I truly expected very little to happen until after that weekend. What a great comfort it was to hear from Shannon the very next morning of July 4, advising me that she was already working on arrangements and laying out for me what I could expect to happen, and when. The e-mails flew back and forth between the two of us that day and the next, as we worked through the necessary paperwork. That was another peasant surprise, as I’d assumed from your website that faxing would be my only communications option. That would have been a big inconvenience for me since I don’t have a fax machine. I was delighted when Shannon offered to handle everything via e-mail. Things were done so quickly, and efficiently, and in a very caring manner. And though I understand your employees have little control over its timing, even the death certificate was completed much sooner than I expected. Shannon kept me a well informed about where things stood at all times, in addition to helping me post two versions of my dad’s obituary (one for the newspaper, one for the web site), plus the slide show. I was so thrilled to be able to post a longer obituary, plus pictures, on the Aria website. So many friends and family who could not be here logged on and commented on how much they enjoyed it. I did meet Samantha when I picked up my dad’s ashes; I suspect she was doing a lot of work in the background, as well. 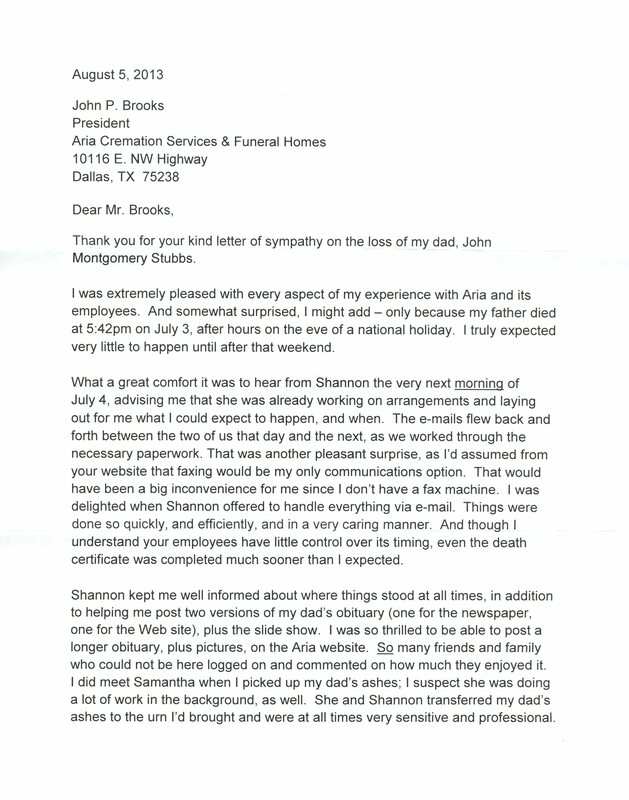 She and Shannon transferred my Dad’s ashes to the urn I’d brought and were at all times very sensitive and professional. The cookies they presented me with before I left were an unexpected but nice touch and made me smile. Likewise, the color copies of my dad’s obituary that arrived in the mail last week were a welcome extra service. Finally, I must compliment your driver who picked up my dad the evening he died. I apologize I did not write down his name. But as our first face-to-face contact with your company, I must say he did a stellar job – from his professional appearance, to the way he handled my dad, to the sensitivity with which he carried out his work. He even shook our hands and assured me, before driving away, “Don’t worry – we’ll take very good care of your dad”. It was also my first experience with cremation, so I almost felt he was reading my mind when he said that. 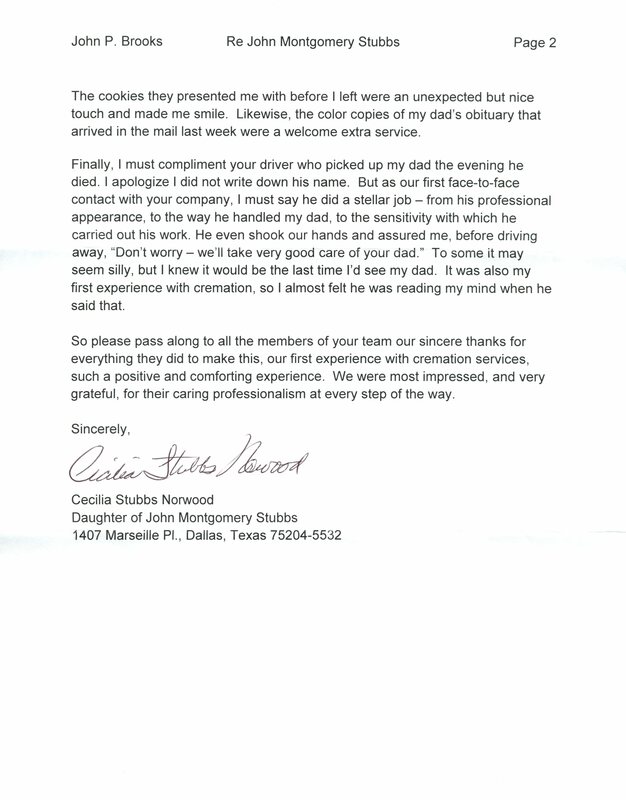 So please pass along to all the members of your team our sincere thanks for everything they did to make this, our first experience with cremation services, such a positive and comforting experience. We were most impressed, and very grateful, for their caring professionalism at every step of the way.